Logic gates are the building blocks of digital technology. It is a mechanical, optical, or electronic system that performs a logical operation on an input signal. Truth tables are used to help show the function of a logic gate. Simple Logic Processor Circuit or you can say a simple computer. Logic gates are primarily implemented using diodes or transistors acting as electronic switches. We have made three basic logic gate using Diode and NPN Transistor. OR Gate, AND Gate and 3rd is NOT Gate. LED’s as indicator used to show output level high(1) or low(0). 3V power supply is enough for the circuit. 1. 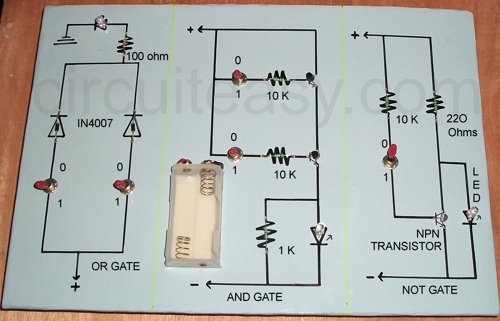 For AND gate I have used 2 NPN Transistor (BC548) in series whose each base is driven by separate switch and resistance. Output is connected to a LED through a resistance of 220 ohms. 2. 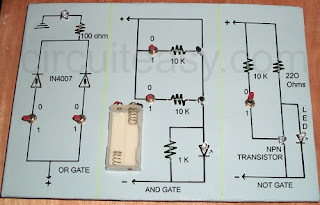 NOT gate also known as inverter I have used single NPN transistor as shunt. In normal condition current flows through 220 ohms resistance and LED which results glow but when switch is in ON position then transistor conducts and current flows throw it rather than LED because of low resistance. In other words at ON position there is a voltage drop at output because of transistor conductance. By combining both the gate (AND Gate + NOT Gate) you can make NAND logic gate. 0 Response to "Logic Gates Truth Tables"